As I played Sleeping Dogs this past weekend, I kept getting into car accidents. Every time I'd hop onto my motorcycle or into a car, I'd find myself getting into head-on collisions with the residents of Hong Kong; I couldn't keep a car in good condition for thirty seconds of driving, and I couldn't manage to stay seated on my bike. Needless to say, this made escaping from the cops a real chore. It wasn't that I was a bad driver, though—I may not be as awesome a driver as Tina is, but I'm no slouch behind the wheel. No, the reason I kept getting into accidents was simple: In Sleeping Dogs, just like in Hong Kong, you have to drive on the left side of the road. That's okay though. I may be bad at it, but it turns out I really dig driving on the left side of the road. I've played so many Grand Theft Auto-style games that Sleeping Dogs puts a certain part of my brain onto autopilot. The rhythms of the game, the sidequest-sidequest-mainquest-sidequest flow, the way that the screen fades into a cutscene after you roll over a quest-triggering hotspot… it's a soothing balm for an open-world-crime veteran like me. But I also love it when my auto-pilot gets jostled and I have to pay attention. No, you can't car-jack that guy from the left side! What are you doing, driving into oncoming traffic? Steering wheel on the right! Driving lane on the left! After over a decade of driving both in the real world and in GTA-style games, I'm amazed at how thoroughly ingrained little things, like left-turning across traffic, have become. 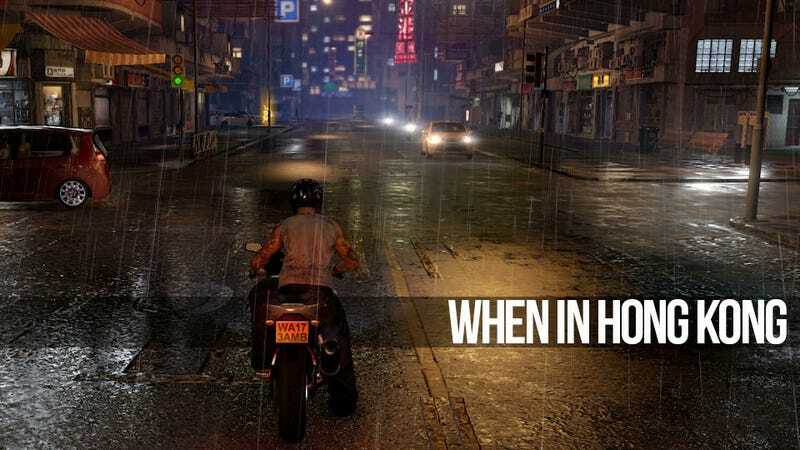 In Sleeping Dogs, you left-turn directly into the closest lane, and that's on a two-way street! At this point I'm not making the error anymore, but driving on the left-hand side of the street certainly hasn't begun to feel second nature. Sleeping Dogs adds a number of other nice little tweaks to the GTA formula—the ability to press "X" to ram your car into the car next to yours is particularly welcome. But I'm enjoying that the coolest thing it does is simply mimic the real road-rules of Hong Kong. Sleeping Dogs isn't the first game to feature British-style roadways; the London-set The Getaway did as well, though I've never played that game. But Sleeping Dogs does it very well, and makes me long for other games that force me to adapt to local customs and laws and in so doing, let myself be transported into the worlds of the game. This kind of quick subversion of an expectation is what makes a game stick with even the most seen-it-all gamer. The way Retro/Grade moves backwards in time is a great example of this—who knew it would be so disorienting and cool to play a music game backwards, from right to left? And I always liked the idea floated by Ben "Yahtzee" Croshaw, (apologies, I can't seem to locate the link), in which he discusses a theoretical game in which the protagonist begins very strong, then gradually loses his/her powers over the course of the story; as the player gets better at the game, their character gets weaker, until they have to overcome the final boss with grit and skill alone. It's the kind of easy flip of our gamer expectations that makes for a memorable, possibly paradigm-shifting game. The fact that players have to drive the left is just icing on the cake—but it's delicious icing. I'm already absorbed in the world of Sleeping Dogs: I'm walking down the waterfront after a hard rain, streetlights glistening off of the pooled water on the wooden docks. I head up to the street and steal a car, and as I do so, I think: "Okay, man; rules of the road. You're not in America. Let's do this right." And by right, of course, I mean left.